Will hearts soar when pigs fly? Alex’s job working for his family-owned radio station once took him all over the city reporting on major events—until the accident. His scars, both physical and emotional, cause him to withdraw into a self-imposed, semi-reclusive lifestyle. When his dad requests that he go to the world’s largest hot air balloon festival, he has to find the courage to break his isolation. Now he needs to find the courage to trust and love again. Jeff had already been planning a move to Albuquerque when he lost his home, parents, and dog to a wildfire in California. To begin his new life, he agrees to help his sister and brother-in-law with their balloon at the Albuquerque Balloon Fiesta. 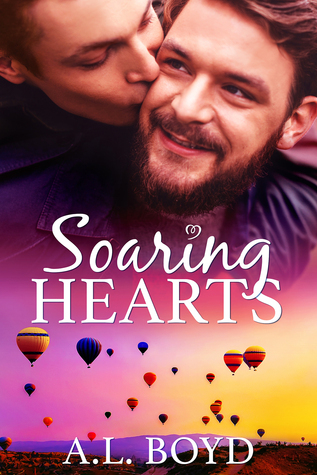 Now he’s seen pigs fly and bees kissing, but will he find the love he’s been searching for? “If you finish your lunch.” Alex agreed. “Me too!” Sandy said from her perch on Jeff’s shoulder. Jeff smiled back at him, and it warmed his heart to see Jeff cradling his niece. He’d never thought he’d find someone who’d see past his scars, much less care for his sister’s kids. “Cotton candy!” Tony bounced in his seat. “You need to bring him to Gramma’s dinner,” Tony informed him. A cartographer by day, A.L. Boyd spends most of her free time with her horses, gardening, or reading. She never intended to be a writer, but stories like this one sometimes just pop into her head. The writing came about as a way to get the stories out. Her first story for the Goodreads M/M Romance DRitC event Crest Ridge Vacation was expanded to the novella titled Crest Ridge.